FQB "Woof" Collection has "gone to the Dogs"! 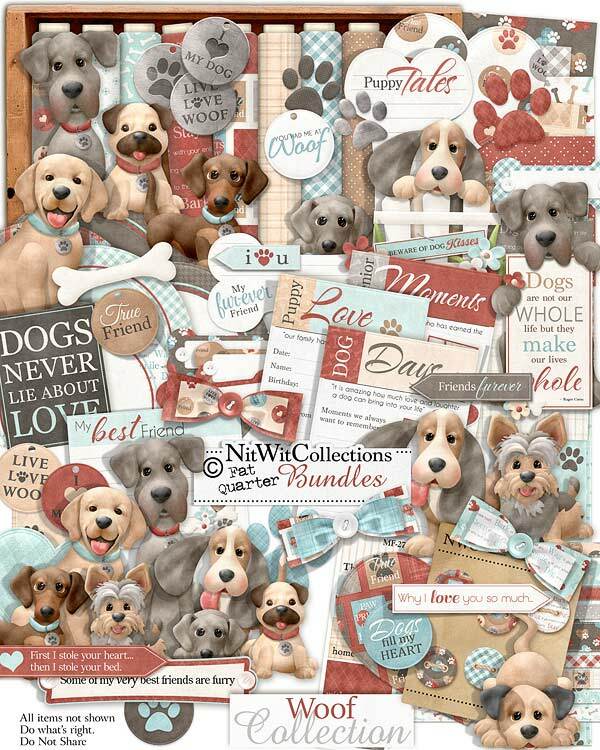 It is an incredibly fun digital kit to celebrate your best furry friend with. We all know a dog lover and we all know how many photos and occasions we have for our beloved dogs. This kit has it all to create the most wonderful scrapbook layouts, mini albums and cards! 1 Hushpuppy like dog...named Arnold! Watch out for the wet tongue!! 1 Arrow element - "I Love (paw) You"
1 Arrow element - "Friends furever"
1 Arrow element - "First I stole your heart...."
1 Arrow element - "Why I Love you so much...."
4 Arrow elements - blank, for you to express your feelings, names, etc. on. 1 Bone - now I thought there were two.....what is that new mound of dirt in the backyard??? 5 Circle mats...the perfect background element to place your main image on or perhaps a photo?? 6 Dog Tags - each with unique sayings on them to help you easily create the perfect layout or card! 4 Dog Treat journal bones - what would a dog kit be without a bone shaped area for journaling, maybe the dog's name, etc. 1 Dachshund like puppy named Duke....just look at those eyes!! 1 Dachshund like dog named Harvey...or whatever name you'd like! 1 Journal card - "Dogs never lie about Love"
3 Milestone journal cards with a photospot- one as "Dog Days", one as "Puppy Love" and one as "Senior Moments"
1 Pug like dog named Smithers...adorable?? 1 Word art of the collection of dogs with the phrase - "Some of my very best friends are furry"
1 Word art with the Hushpuppy standing on a picket fence - "Beware of Dog Kisses"
1 Word art with the Great Dane holding a journal card - "Dogs are not our whole life...."